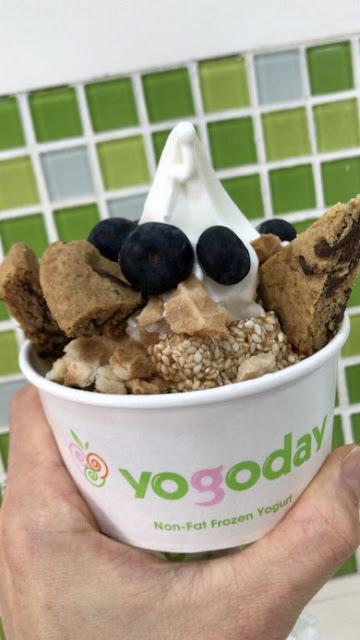 Yogoday is known for their both their healthy treats and their super sweets. All of their frozen yogurt is non-fat or low-fat, and only minimally sweetened. It is made from natural ingredients, using local dairy products and techniques from Italy. (The Owner, Mohamad has loads of experience in the food industry, and so has done his research and testing to find only the best ingredients.) There are usually 6 flavors of yogurt that cover the bases from Chocolate, Vanilla, and Plain Tart (my favorite) to special fruit flavors that change every now and then...like Watermelon and Blueberry. Once, you choose your flavor, you can add as many or as few toppings as you like... like a sprinkle of roasted cashews or fresh plump blueberries, or... if you are like me.... a few chunks of warm, soft, homemade cookies. They also make some super creamy milkshakes that still manage hold on to the "healthy" tag. Like the Banana Shake which has nothing but skim milk, yogurt and fresh banana.... but it is so thick and creamy you feel like you have just had a decadent treat. Then, if you have a serious sweet tooth, you can enter the world of their Crepes. While you can request a crepe as simple as you like, Yogoday is really known for their crazy concoctions like The Tiramisu- which is practically a tiramisu cake inside a crepe, and their super popular Candy Crepes. For example, The Crepe Kinder. Yep. It has a whole Kinder bar inside AND out, and then drizzled in decadent Belgian chocolate. And these crepes are NOT small. Your sweet tooth will be satisfied. And what really makes Yogoday great is the management and the staff. Owned and operated by a super kind family man with hopes of spreading his love for sweet treats (both healthy and decadent) to everyone here in Abu Dhabi. I was trying to decide on just one crepe (although I easily could have eaten three, they looked so good), when Mohamad came by. He could see me keeping one eye on my toddling two-year-old, while trying to read the menu. "I can watch her", he said. "I have had five girls of my own." YAY! Anywhere I can take my eye off of my kid for two seconds is ok by me, especially if they serve dessert! Hmmmmm….maybe we should start a weekly Mom's club at Yogoday…. Check them out on Facebook, www.facebook.com/yogoday, they occasionally have contests *with prizes*.